Lady GaGa big eyes effect in black. Make your eyes look bigger and brighter with a doll like appearance. ColourVue Big Eyes Dolly Black contact lenses will give your eyes a beautiful, deep black colour arranged in a pretty, natural looking pattern. What's more they will make them look much bigger than in reality, as they have a dark outer edge. Thanks to that your gaze will seem more distinct and deep. 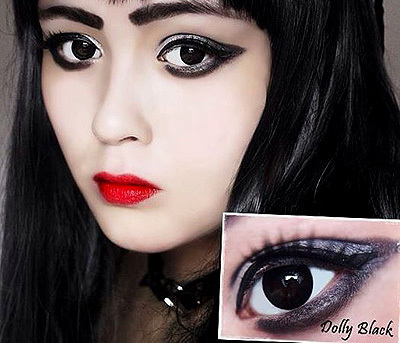 Try ColourVue Big Eyes Dolly Black if you are looking for a striking effect that can be used both on a daily basis and with special costumes, cosplays, Halloween, etc. It's up to you how to use these lenses, we can assure you that they will do their job perfectly as they have a very distinct colour, they are comfortable and available in prescription.